Want to create your own livery? We provide a self-explaining paintkit for creative x737project version 5 users. You need Adobe Photoshop or compatible software to work with the layered pictures. Get the HD-paintkit for the x737 v5 here! A complete livery should contain all texture files which are different from the default livery. 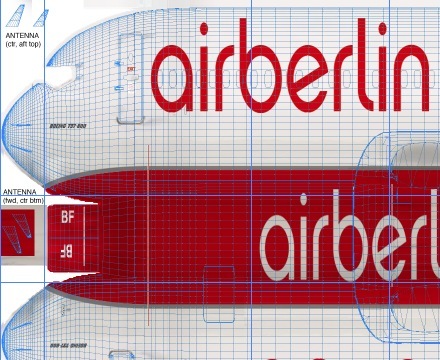 Normally you need to create the fuselage, fin, engine and winglets (either blended winglets or split scimitar winglets (SSW)), and for the interior, create the seats. In some cases you need another maingear wheel color, and finally some airlines have registrations on the wings. See one of the many liveries available for our x737project aircraft as example. Besides the 'objects' folder containing the paints you should provide a 'conf' folder with a configuration file, setting up the crew member names and equipment flags for the aircraft, a template is included in the paint kit. See any of the x737 liveries for example files. If you want to share you work with the x737 community send us your livery! We will release it with the next update, and you will find your place on the list of liveries and authors. Many thanks to Vaeceslav Sluto for making this wonderful paintkit! Thank you for contributing your work!